In our last post, we showed you what happens to each of the common materials used in outdoor cabinets when you use a pressure washer on them. Closely related to that–how easy is it to clean these cabinets if you don’t want to get out the pressure washer, or just want to touch up a few spots? If you read some competitors’ fine print, they specify a list of some really common household cleaners that you cannot use on their cabinets–cleaners such as bleach, Tilex and even SoftSoap. SoftSoap!!! Damage from those cleaners will void those warranties. In this post, we show you that some of the cleaners they tell you not to use are the very same cleaners that we recommend that you DO use on Werever outdoor cabinets. Taking it a step further, we show you how quick and easy cleanup is. 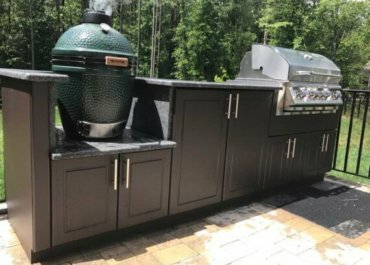 You want to spend your time enjoying your outdoor kitchen, not spending all your time worrying about care and maintenance!